It’s tough to find the balance. God gave us everything we have and asks only that we take good care of it. 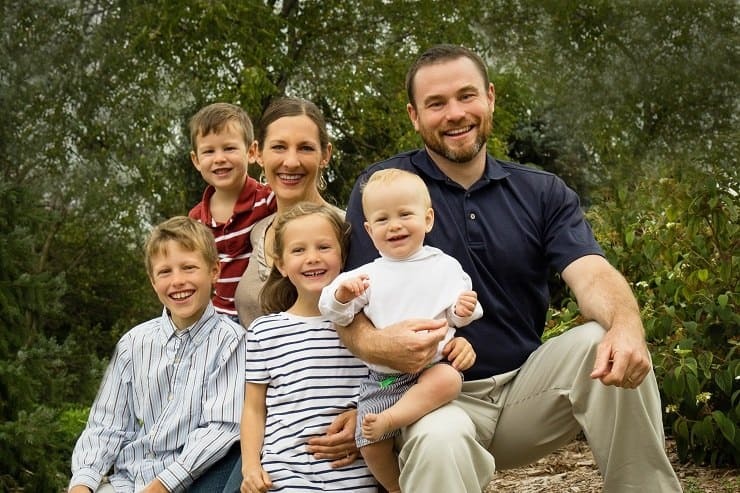 I’ve been on the real food and natural living journey since 2005, at first encountering frustration after frustration as time and budget pressures competed with my health goals for my family – I know you know how hard that is. I’m still learning, but I’ve discovered a myriad of tips and strategies along the way to keep my sanity and make a real food lifestyle possible, and even enjoyable! Here at Kitchen Stewardship, I serve people who struggle to juggle it all. It’s my joy to bring my experience to the virtual table to help other women (and men) achieve balance. I’ll give you the tools to have more real food in your kitchen and tips for sustainable living, while sprinkling in time for fun. I’m not perfect – but I believe with baby steps we can achieve more than we thought possible. Four thriving children…who eat their vegetables! An “entrefamily” where my husband and I can both work from home…and eat well, together. You’ll find a heavy dose of grace in the moment here at KS, and readers tell me it’s a little like a chat over a backyard fence – knowing that someone else is in the same place you are and getting encouragement and strategies to swim upstream instead of being washed away by overwhelm. And when I’m not in the kitchen cooking up a new recipe or at the computer adding another late-night post to the blog, you can find me playing with the kids or out for a walk in the fresh air. My husband thought it would be a pipe dream when I started looking into raw milk…and then we owned part of a cow before he knew it. It wasn’t long before I was making homemade yogurt and sourdough bread, and it wasn’t long before we found the need to explore a gluten-free and occasional grain-free diet to help my husband through some health issues. I cleaned up our cleaning and personal products, too, including personally testing over 100 natural sunscreens (and we add more each year!). And now that my kids are getting older, I’m determined to teach them to cook too, so they don’t get stuck in our fast food culture. In fact, we’re teaching thousands of other kids around the world to cook! I’d love to connect with you and hear about your journey, too. Buckle your seat belt and let’s roll into real food and natural living together – I’ve got email options to fit your inbox style and am always happy to find a reply from you in my own inbox. YES! COUNT ME IN FOR ALL POSTS! YES! I WOULD LOVE TO CONNECT WEEKLY! 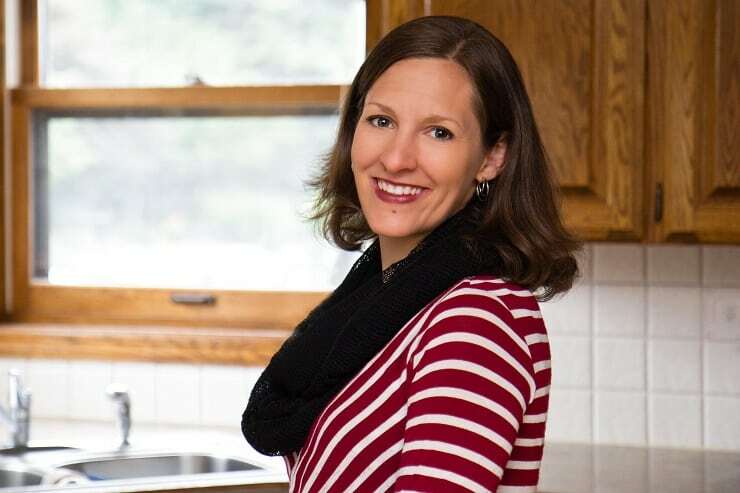 As a former teacher and avid lifelong learner, I was appalled by the state of food in our country when I finally started “getting healthy” during my first pregnancy, and even more overwhelmed trying to feed that little baby nourishing food once he was born. My questions about what to eat and struggle to balance it all led me to discover strategies that really worked: to be frugal, environmentally-friendly, and eat real food, all without losing my sanity. I realized I had to share my techniques with others so that they too could achieve some balance while being good stewards of the gifts they’ve been given. 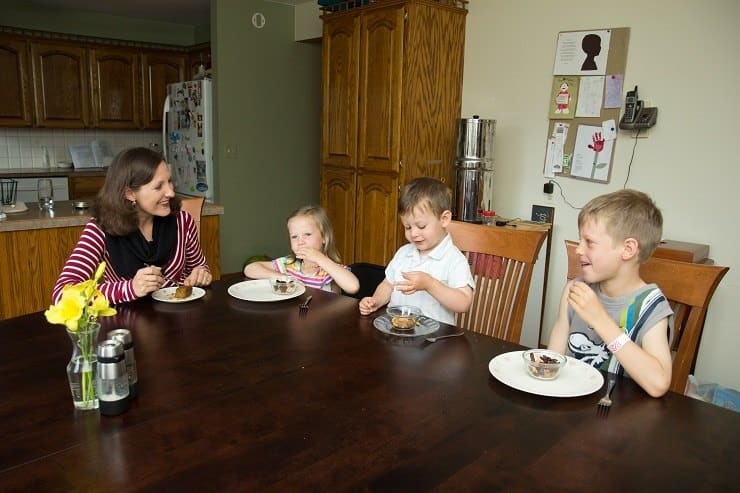 My journey to real food and natural living has become the dialogue at Kitchen Stewardship for over 7 years now as I encourage other moms to take baby steps to better nutrition for their families. It’s been all about the baby steps ever since then, and I still stand behind my top 10 baby steps – the changes to make for the biggest impact on your health and environment with the least impact on time and budget. For those of us who spend a lot of time in the kitchen, we are met with challenges in all four areas a daily basis. It can be daunting to try to do our best to be good stewards of them all, especially as science finds out more about how we harm our bodies and environment with chemicals and the world tempts us to live beyond our means in many ways. Kitchen Stewardship is about finding the balance, doing the right thing to give glory and honor to God, becoming more prayerful in the kitchen, and rejoicing in the accomplishment of baby steps on the road to perfect stewardship. I do have to say Katie….your website has transformed my kitchen! I have to tell you, I’ve been blessed and inspired by everything I’ve read that you’ve written. You seem to be writing from MY heart. I found Kitchen Stewardship in the google search results for homemade chicken broth. I kept looking until I found yours because I wasn’t satisfied with any other source. You had so much more information than just a recipe and it helped tremendously. I had no idea at the time how expansive KS is. I found it at the perfect time as I was ready to hear real food evangelism-I’d just found out about white sugar and began reading many labels when a friend did Whole30 and was very surprised. I’ve learned so much in the past few months, even successfully made yogurt on my first try thanks to your guide. I love to cook, love to try new foods/recipes/ideas. I absolutely love all of your recipes and find myself on your blog multiple times a day looking something up. I pull my phone out at Trader Joe’s all the time to “see what Katie suggests”. I swear I need an app to your blog! You have helped me go from being inspired to cook healthy, to actually doing it all the time. Most of my friends can’t believe I cook 3 meals a day for my family of 5 from scratch. No boxes (most of the time), nothing pre-prepared (most of the time), and tons of nutrition (most of the time). Can I simply say that we are LOVING your course? My kids are ages 2-13, and they are so excited when I tell them it is cooking class day! The 13yo (son) and 11yo (daughter) ASK without any prompting from me if they can start making lunch/dinner. It has also been SO helpful that I can count on my ‘littles’ to wash, peel and cut soft stuff as well as butter their bread and on the ‘bigs’ to cut the harder veggies. Thank you for listening to God’s call for using your talents. You are a blessing! That last one is about the Kids Cook Real Food eCourse, a real labor of love that my kids and I put together. 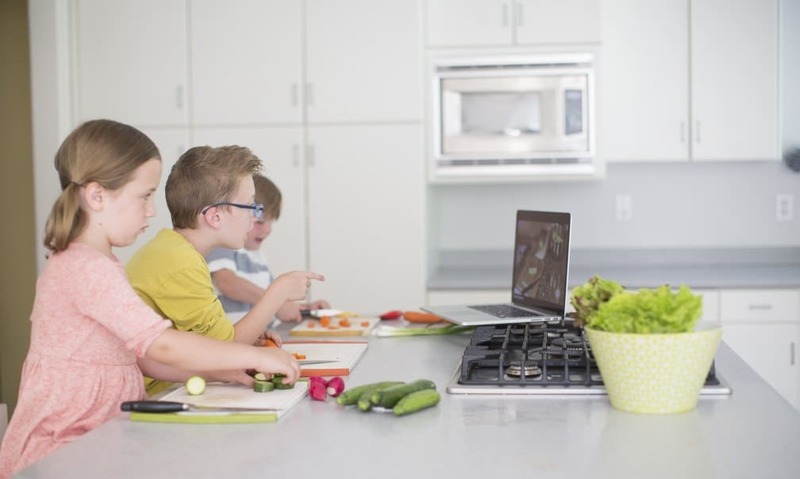 It’s a massive online cooking eCourse for kids ages 2-teen that teaches the basics of cooking via video and kid-friendly recipes. We have members from literally all over the world (every continent but Antarctica) and are so excited to spread the joy of real food cooking! Interested in teaching your kids to cook? If you don’t want to miss out the next time I offer my eCourse, then just let me know and we’ll write to you as soon as it’s available. You’ll also receive a PDF of skills your child can perform at their current age. Don’t miss out! As always, you’re welcome to contact me with any questions or future topics I can address.